On Saturday August 11, 2012 the same events of three days earlier repeated themselves in Khan Al Luban. A group of 4 illegal Israeli settlers, from Ma’ale Levona, armed with guns and wooden sticks, came into Khan al Luban at 10:30 p.m. The settlers yet again broke into the house owned by Khalid al-Hamed Daraghmah where international activists and the 2 sons of Khalid were staying. When the settlers arrived, Khalid’s sons and the international activists asked them to leave the property, but they refused and instead sat down near the spring on the Daraghmah land. 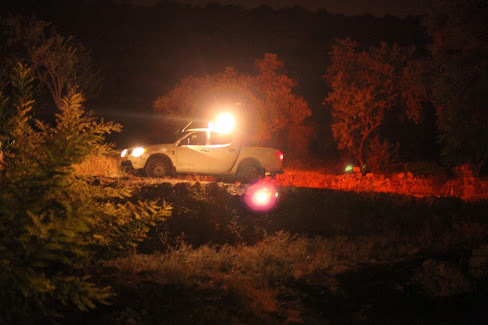 After about half an hour, 2 Israeli police cars arrived along with 2 military jeeps after having received a call from the settlers. A few minutes later, 2 more military jeeps arrived at the scene. By then, the Daraghmah land was full of Israeli police, soldiers, and security guards from the illegal settlement. The soldiers entered the house searching for weapons, but as usual they did not find anything. Click for more pictures. Photo by Marcus Fitzgerald. 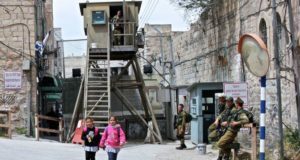 Around midnight, the soldiers, police, security personnel, and settlers left the area while Jamal, the oldest son of Khalid, and the international activists remained in the house. Throughout the night settlers stayed on patrol in the street near the Daraghmah house, shouting and honking the horns of their cars. At 7:30 a.m. the following morning, a border police car stopped near the Daraghmah house on the road leading up to the illegal settlement of Ma’ale Levona. The border policemen then proceeded to break into the house, aggressively asking for passports and other documents. Like the night before, the house was searched and no bag, cigarette package, or piece of clothing went unturned. Jamal was brutally pushed into one of the rooms by the police officers where he received several blows to the face before he was handcuffed and taken away. 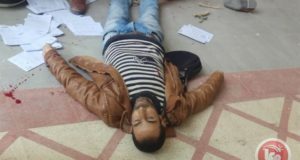 Jamal was taken to the Israeli police station of Binyamin, wrongly accused of having hit a soldier. He was released on bail the day after. 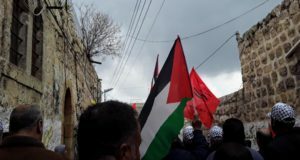 The continued pressure of the Israeli occupation forces and illegal settlers remain a a constant threat during both days and nights in Khan al Luban.